Fitness is something that should be on the priority list of each and every individual be it a politician, a Bollywood actor, a sportsperson or a common man. Being fit should be the urge in every individual and it seems that it definitely is in our newly elected Information and Broadcasting minister, Rajyavardhan Rathore who also is the Sports Minister who yesterday threw a fitness challenge for many people on the internet. Well, it seems that being the Sports Minister, his connection with fitness is really strong and in the video, it can be clearly seen how greatly he is doing the pushups so well. Yesterday, Rathore took to his Twitter account and threw a fitness challenge to Hrithik Roshan, Virat Kohli and Saina Nehwal and in the video he can be seen going down to the floor to perform push-ups that he did without any pause. Soon, his challenge spreaded like wild fire on the internet and it became a hashtag #FitnessChallenge for others to accept. 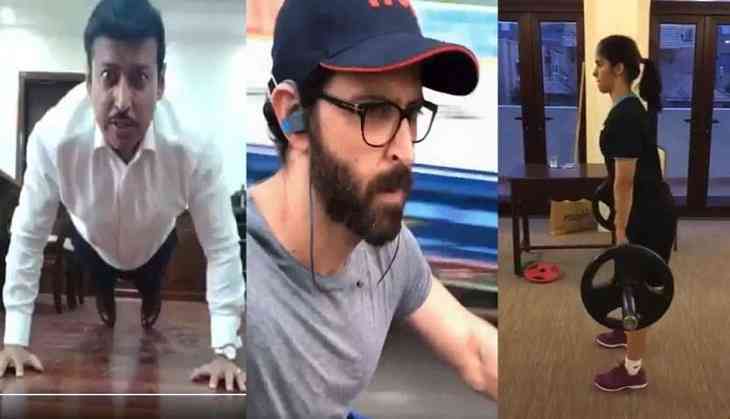 Hrithik Roshan, Saina Nehwal, Jayant Sinha and many others on the social media accepted the challenge and posted their videos doing something that keeps them fit be it cycling, pushups or Surya Namaskaar. Saina, on one hand further nominated Rana Daggubati, PV Sindhu and Gautam Gambhir while Hrithik nominated his family members Pinkie Roshan and Rakesh Roshan and friends Tiger Shroff and Kunal Kapoor to further accept the challenge. As Hon. PM @narendramodi ji envisions a healthy India, I join the #HumFitTohIndiaFit 🇮🇳 initiated by @Ra_THORe ji. Here's how I stay fit. Post your videos & join us. Talking about Rajyavardhan Rathore, he is 48-years-old and has also won a silver medal in Olympics shooting.